Russian media received President Putin’s annual address on Thursday with varying degrees enthusiasm. RT, for example, ran headlines such as ‘Listen to us now’: Putin unveils new Russian nuclear arsenal, whereas critical media chose to focus on cases when they found that the audience had been misled in the speech. For example, the independent Russian online outlet The Insider, which has an entire section of its website devoted to fact-checking, published an analysis of nine points where the journalists found that the President’s points had to be corrected. The Insider’s nine points include, among other examples, demographic forecasts, pension issues, cost of healthcare, growth among small enterprises. However, the parts of the speech that attracted most attention in The Insider’s analysis, as well as in other Russian and international media, were those linked to Russian military technology. The highlight of President Putin’s annual address on Thursday was an animated video showing a new and powerful Russian weapon named Sarmat. The missile can allegedly reach any place in the world from Russia, and it was claimed to render foreign missile defence systems useless. 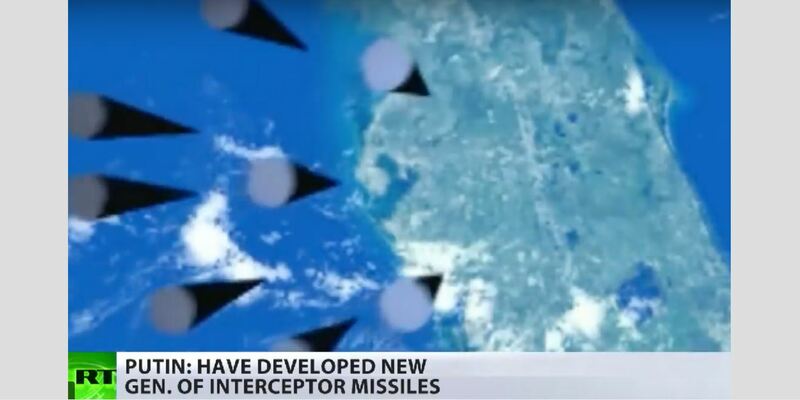 A video screened during the speech showed how Russian missiles are carried over the North or South Poles, landing in a geographical area easily identifiable as the US State of Florida. However, as several of the independent media noticed, among them The Insider and Republic, the culmination point of the new video when Florida is bombed appears identical to an animation produced 11 years ago by the Russian state TV station Pervy Kanal. 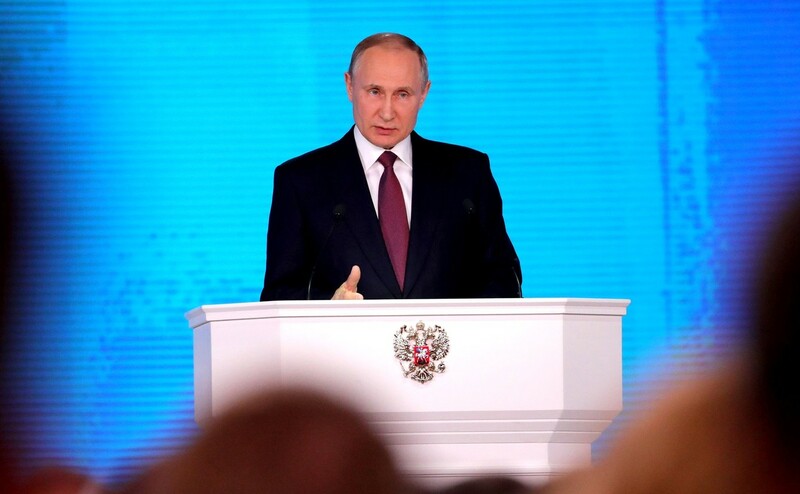 The old video showed the capabilities of another weapon, which was then presented as Russia’s new super weapon – a weapon President Putin in his speech on Thursday said that the new weapon would now replace. 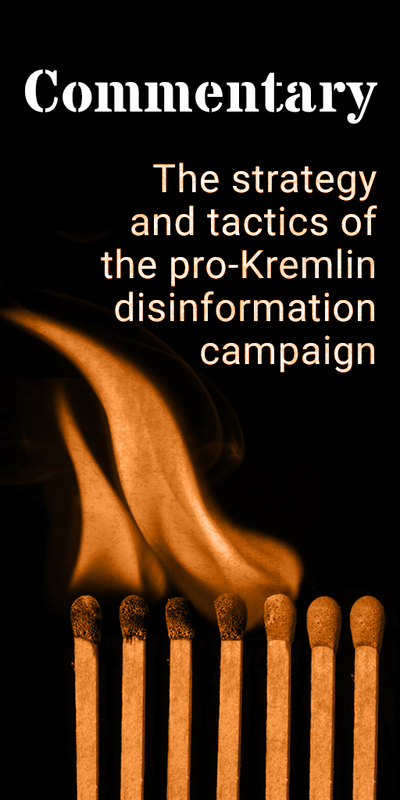 It is not the first time we see creative use of video footage in the pro-Kremlin propaganda – see our articles ‘Computer game as “irrefutable proof”‘ and ‘Oops, we did it again‘. The President’s spokesperson had already before the annual address underlined that it would coincide with Vladimir Putin’s programme for the elections to be held on 18 March. Where is the tie between recycling an animation showing Florida being bombed with nuclear warheads and the upcoming Russian presidential elections? The dominant narrative in Kremlin-loyal media is about war: According to the pro-Kremlin disinformation campaign, Russia is encircled by NATO, the EU and Ukraine. George Soros tries to instigate colour revolutions in Russia’s neighbourhood, and so do American and European diplomats and Russian human rights defenders. According to independent polling, Russian respondents see the US, Ukraine and the EU as Russia’s top enemies. 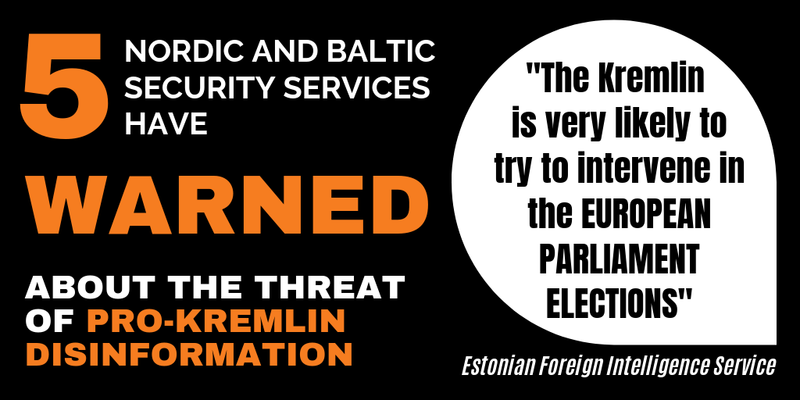 This “besieged fortress” narrative is by no means new; however, Thursday’s address indicates that the election campaign will focus on Putin as capable of protecting the nation – the fortress – against these foreign threats. This is the narrative that aims to ensure the success many Russian commentators refer to as “70-70” (70% support of Putin and 70% turnout as a minimum threshold of success). The punchline in Putin’s address, which followed after the demonstration of powerful weapons, was “Listen to us now!” This suggests that Putin’s election programme focuses on putting Russia in an offensive position as a response to a perception already promoted by pro-Kremlin disinformation of a Western offensive position towards Russia.